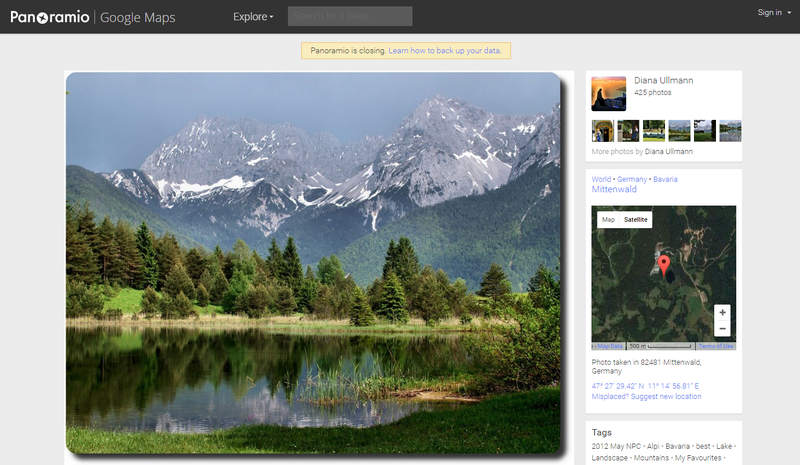 Panoramio, the location-centric photo sharing service Google acquired in 2007, will show its last image on November 4. For the longest time, Google used Panoramio to augment its Google Maps and Google Earth services with crowdsourced imagery. Now that the company has integrated photo uploads into the Google Maps mobile apps and launched its Local Guides program, Panoramio clearly isn’t a priority for the company anymore. Google previously tried to shut the service down in 2014. At the time, its users successfully petitioned the company to keep it open, but this time around, the decision seems to be final. Last year, when Google decided to keep the service going beyond its original closing date, the company said that it would go “back to the drawing board to work on a more integrated solution that supports you and your content directly within Google Maps.” Today, Google is encouraging active Panoramio users to join its Local Guides program and to upload photos directly to Google Maps. For users who have linked their Panoramio and Google+ accounts, Google will automatically copy their images to a Google Album archive (that’s Google service for downloading copies of images from all of its services). Users will also still be able to access their photos in Panoramio for a year after November 4. Unsurprisingly, Panoramio’s users aren’t impressed, but today’s incarnation of Google/Alphabet isn’t shy about shutting down services that have outlived their usefulness. Sadly, that’s also true for Panoramio, even if there’s still a small but lively community on the service.